EO Products makes a lot of my go-to's for skincare, but they also make great bath products as well. Their 3-in-1 soaps can be used as bubble bath, shampoo and body wash. The line is comprised of seven soaps for adults and three for children. Each soap is made with a blend of aloe, calendula, chamomile and white tea extracts which leave skin and hair silky soft. There are scented varieties as well as an unscented option for those with especially sensitive skin. I have the Mint Coconut soap as well as the Lavender children's soap. The Mint Coconut 3-in-1 Soap has the fresh scent of spearmint, peppermint and coconut. It's really rejuvenating and unlike scents I typically gravitate toward. I think this scent would appeal to both men and women equally - which is nice especially if you're using the same soap! They do make scents geared specifically toward men, including Cucumber & Melon and Cedar & Citrus. Other options include Coconut & Lemon, Lavender & Aloe, Citrus & Mint and Unscented. The Kids Lavender Lullaby 3-in-1 Soap is equally versatile and great for those nights when bath time needs to be quick. Having one soap for everything head to toe makes things so easy. And I love that it also makes bath time fun with bubbles. No more using bubble bath with artificial scents! This soap is much better for my little one's sensitive skin. The lavender is really calming too. Other scents include Tropical Twist and Orange Squeeze. I'll definitely be trying those out in the future. 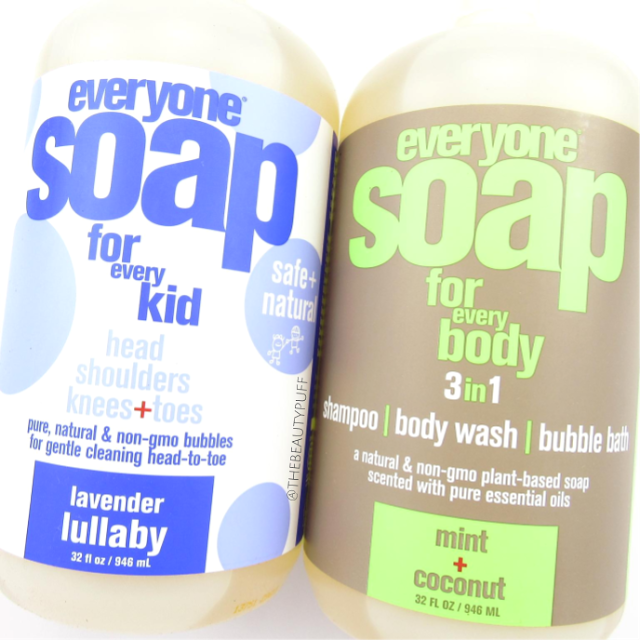 Each 3-in-1 soap comes in a 32 oz recycled bottle which is a great size for the whole family to enjoy. As with all EO Products, these soaps are gluten free, cruelty-free and made without synthetic fragrances. You can find the entire line of 3-in-1 soaps on the EO Products website below.